gamecam pictures, riveting conversations and amazing hunters. Plus, it's easy to customize your streams any way you like. Passionate about bowhunting? Simply select the Bowhunting tag from your Hunting stream! 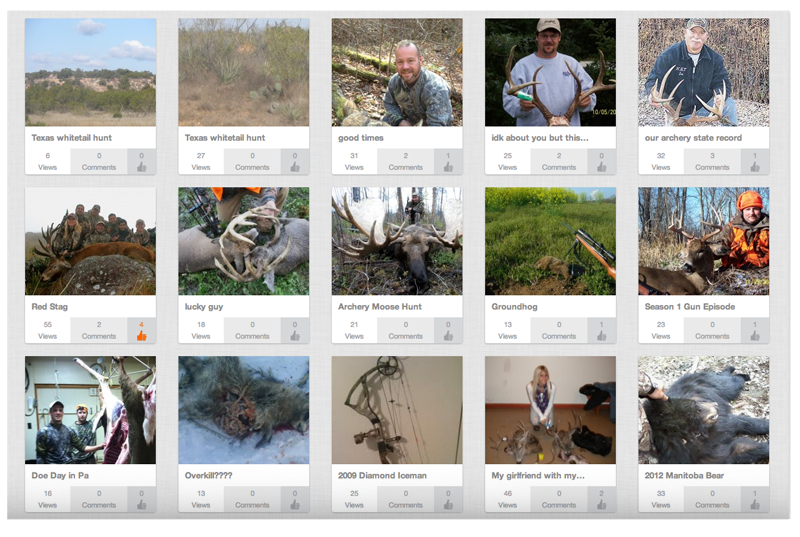 HuntDrop "Drops" are fun and easy way for you to save, share, organize and find everything you love about hunting! Plus, we've made the process so simple your grandma could do it. You can Drop pictures you love straight from your computer using the button (on the upper right hand side of your screen), or from anywhere on the web using the coolest app we've developed to date, the Drop button for your web browser. We’ve specially categorized certain Drops (Hunts, Products and GameCams) with unique features for incredibly fun dropping. 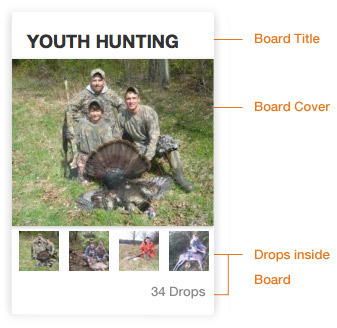 With HuntDrop Boards you can effortlessly organize and showcase all your drops and favorite things about hunting. 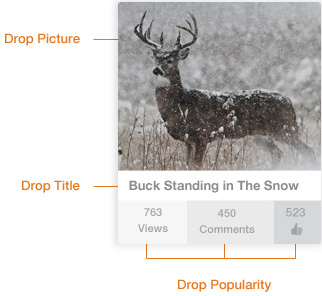 New Drops are automatically placed inside your customized Boards on any topic you choose, such as “Bow Hunting”, “Hunts With Dad”, or “Gear I Want”. Ready to tackle hunting's biggest questions? With next-generation design that makes old-school 'forums' look obsolete, HuntDrop makes it possible to connect with other hunters in ways like never before. We make discussions about hunting more enjoyable than they've ever been, but it's really all about having YOU, the HuntDrop community, bring the site to life. You’ll be surprised how easy it is to find hunters near and far that share the same interests as you. By interacting with Drops and taking part in Conversations, your connections will naturally fall into place. So what are you waiting for? 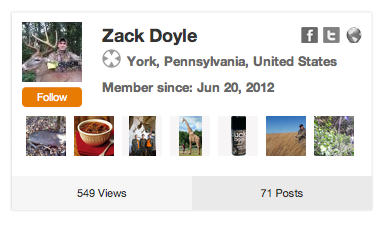 Start connecting with the world's greatest hunting community today!